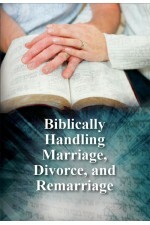 There is much controversy in the church today regarding what the Bible teaches about marriage, divorce, and remarriage. What is a “Biblical marriage?” Are there legitimate Biblical reasons for divorce? What about remarriage after divorce? The hope for this booklet is that it will encourage the reader (whether single, married, divorced, or remarried) with God’s Word. The God of the Bible is Love! His ways are best. They include forgiveness and a multitude of tender mercies through Jesus Christ. Our loving Lord has a future for each of us no matter what the details of our past might be. This is an eBook. When you purchase it, you will be able to login to the store and download the martin_marriage.zip file. Unzip it and it contains both the ePub and Mobi files for your eReader.